Thorn Lighting, a global supplier of outdoor and indoor luminaires with integrated controls, has launched Cetus Mini, a downlight suitable for replacing traditional halogen downlights in residential and commercial applications. Expanding the existing Cetus LED (light-emitting diode) range, Cetus Mini benefits from a special reflector optic with a beam angle comparable to MR16 lamps for visual uniformity. The option of fixed or adjustable recessed LED downlight comes with a high efficacy of up to 95 luminaire luminous flux (Llm)/W. 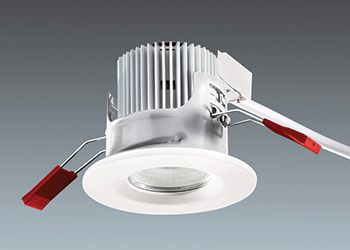 With the integrated LED module, it allows a recessed depth of less than 101 mm for installation in shallow ceiling voids. Cetus Mini has a small 68 mm ceiling cut-out. Cetus Mini is offered in two trim finishes, white or chrome. It is available with 550 lamp luminous flux (lm) in colour temperatures of 3000K and 4000K and IP20 or IP65 for use in bathrooms. In addition, fire-rated (30, 60 or 90 minutes, 77 mm ceiling cut-out) versions of Cetus Mini are also available. 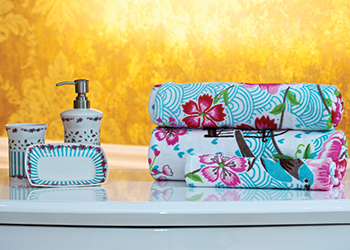 US home furnishing brand Pottery Barn has launched its new collection across the GCC. This season’s assortment features everything from the bedroom to the bathroom, kitchen to home office, and from the entrance way to the backyard. The collection features exquisite pieces crafted and curated to perfection, according to a spokesman for the company. “Discerning home enthusiasts can take inspiration from the simple yet modern design of the coffee table, which accentuates the beauty of the chestnut finish base, with marble creating a striking mix of texture and colour,” he says. “The new eco-friendly handcrafted wooden Bowry furniture collection has been styled with acacia, teak and mango and every piece is a singular work of art,” says the spokesman. Pottery Barn’s dining table essentials include the meticulously detailed and richly festive Caroline Paisley tablecloths and napkins. 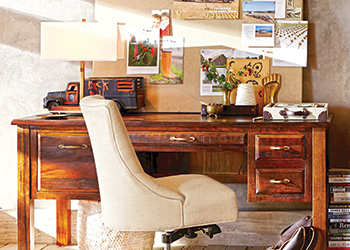 With inspirational lifestyle displays dedicated to every space in the home including the living room, dining, bedroom, bath and outdoor spaces, the Pottery Barn stores are designed to make shopping an enjoyable experience. The design studio offers complimentary in-store and in-home design services, where specially trained associates offer expert advice on furniture, decorating and entertaining needs and collaborate with customers to bring their vision to life. Pottery Barn strives to deliver exceptional comfort, quality and value to all its customers through its honoured designs, world-class service and product offerings, the spokesman concludes. UAE-based retailer 2XL Furniture and Home Décor has launched a vintage Parisian collection of home furniture and accessories to celebrate Valentine’s Day. Inspired by the understated elegance of French fashions, the collection is both classy and dreamy. The collection plays with intricately hand-crafted solid wood and classic designs with gold accents. The brand relishes baroque designs in all its textiles and items including elegant dinner plates, classic mirror frames and beautifully carved beds. Operating since 2000 in the UAE, 2XL Furniture and Home Décor has six showrooms across Abu Dhabi, Dubai, Sharjah and Al Ain. Its product range includes exclusive bedroom, living and dining room furniture as well as exquisitely crafted décor items, striking gifting ideas, plush rugs and gorgeous wall art, bed and bath linen, eye-catching tableware, and a functional kitchenware range. “The 2XL range is very classic and French-inspired. Each retail item has been carefully chosen exclusively for 2XL and denotes a lifestyle that is regal, sophisticated and of a finer taste,” he says.